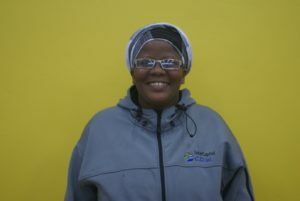 I have been an appointed government Community Development Worker (CDW) since 2007 after a group of local women and myself graduated through the University of South Africa (UNISA) in 2006. I have now been in service for almost 10 years. I think that I was a good choice for this role as I was born and grew up in De Aar and know many members of our community. For the last five years I have been married to my wonderful husband and we have one biological child together. He is a Nigerian national – hence my ‘unusual’ surname, and he is fully supportive of all that I do. I am very thankful for that. In December 2014 Solar Capital initiated its CDW Programme which looked at extremely pertinent issues faced by us workers on a day-to-day basis, including personal emotional development. These aspects are ones that were never addressed in our formal CDW training through tertiary institutions. As a result of poor attendance for the course at first, I offered to recruit further local people without official CDW training as I knew many people who were interested in learning these skills. In the end we had 25 participants starting in 2015. The discussions we had during the course developed us psychologically and assisted us all with escaping our victimised mentality. We learnt not to place all the blame on other people for the way our lives have turned out. We learnt that our choices and our behaviour are even more important in shaping the way things turn out. We must grab every opportunity and make good out of what is offered to us. We also learnt to avoid negativity. I was always surrounded by a negative environment, negative colleagues and negative people in general who don’t see the good in anything. After this discussion I tried to cut ties with much of this, and now I am even more vibrant and active in my job than I was before. When I was busy with the Solar Capital course I also started another course through the Department of Health on sexual / gender based violence. Again I assisted the course coordinators to find extra people and identified four people out of the Solar Capital class. Similarly I assisted a community outreach programme on occupational health and safety to find participants. I recruited 25 people out of the community, including a few from the course. It was tough, but 15 of us passed. In February a woman who is studying to be a social worker approached me for assistance with getting together a group of woman to assist her research on victim empowerment. I sourced 10 women for these sessions which have become of invaluable help to us. We share ideas, we motivate each other, we build each other up, and every Thursday we come together to share learnings resulting from our own life experience or theoretical knowledge. I think that we now need to change the name of this group because we are no longer victims, we are a sisterhood. The Solar Capital course made me realize that there are people out there who need my help. I am capable and I have the ability to help others. I have now seen my potential. I am a person that likes sharing with people, and I am a person who likes motivating other people. In these two years I have changed many people’s lives, just through motivation or convincing them to study further. My personal life has also changed for the better over the last few months. In January this year I went to the Department of Social Development to ask for children that I can raise up as my own. They referred me to three children aged three, eight and 10 who had come from a dysfunctional home where the parents abused alcohol and beat all three of them. Every day these children had to go to the local dumping site to look for food. They were so neglected that they didn’t have clothes or even the most basic things to wash themselves. They didn’t have anything! So my husband and I are now in the process of fostering them. We will look after them and love them in the place of their parents. I am very thankful and grateful for Solar Capital who brought this course our way. I wish that the course will continue in order to train our communities. Each and every CDW needs this training. It made me feel more excited about my job and gave me more energy to change things in the community and in my own life. If you go through this training you will become a better person; that I can assure you.